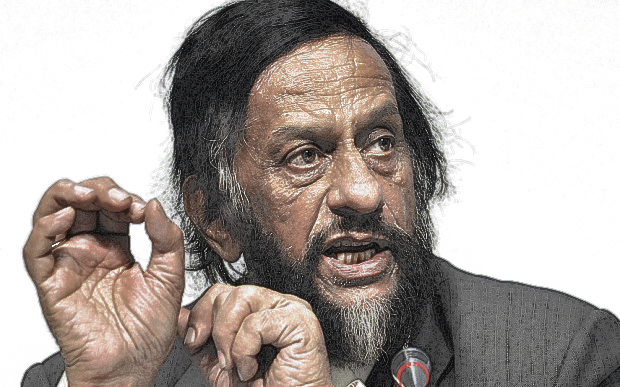 Dr Rajendra K. Pachauri, the ‘top UN climate scientist’ whose humorous monologue on women in science is at the centre of a firestorm in a teacup. Have opponents of the science stooped to using women as political footballs in the quote-unquote climate debate? That’s the question on everybody’s lips with reports that a “laugh-out-loud” riff by Rajendra Pachauri has been taken out of context in an apparent attempt to sic feminists on the climate visionary. Displaying all the humorless literalism we’ve come to expect of them, climate deniers—oh, I’m sorry, dangerous anthropogenic global warming unpersuadeds—are baying for the former IPCC Chairman’s blood. Unfortunately for climate dismissives, though, the individuals and groups who actually speak for women refuse to lend moral authority to their shrill protest. I spoke to several feminists and they all agreed on one point: the Pachyphobes need to lighten up. Connie St Louis, giant of journalism. Connie St Louis, a science journalist who specialises in being a female science journalist of color, said nothing was more pathetic—or a surer sign of irrelevance—than a movement that can’t take a joke. But while Pachauri’s speech had her in stitches, there was nothing funny about denialist objections to it, which are now making the rounds of the Twitterverse. For St Louis, the most distressing feature of this “nontroversy” has been “the patronizing implication that Dr Pachauri’s comments have the power to somehow drive women away” from jobs in science, technology, engineering and mathematics [STEM]. “When detractors [of climate science and the IPCC] suggest—with a straight face—that girls in the 21st century are such trembling, thin-skinned, emotional little dears that they’d allow harmless Mad Men-era banter not only to get to them, but to determine their career path, I find it… devastating,” Ms St Louis told me, choking back tears of anger. This entry was posted in Uncategorized and tagged Connie St Louis, Greg Laden, humor, Naomi Oreskes, Rajendra Pachauri on October 4, 2015 by Brad Keyes. Fans of Rajendra Pachauri are hoping a laugh-a-minute monologue he delivered at a fundraiser yesterday stimulates interest in his earlier work. The polymathic technocrat’s sense of humor tends to be eclipsed by his preëminence as ‘the top UN climate scientist,’ which is understandable enough; if there’s one thing nobler than winning the laughter of the masses it’s winning their tears. This entry was posted in Uncategorized and tagged humor, Rajendra Pachauri on September 22, 2015 by Brad Keyes. Readers may recall our coverage of yesterday’s address by Rajendra Pachauri at the annual Women In The Laboratory fundraiser. Pro tip! You can tell when Dr Pachauri isn’t having an ironic laugh at the expense of the conventions of the genre: he always takes off his glasses if he’s speaking literally. Given that Pachauri was speaking to a whole room full of women, you’d think it would be fairly straightforward to find out exactly what he said. Strangely, though, there seems to be material disagreement on a whole range of quotes in Kay Fabe’s report. Just hours after the fact, we’ve already heard two irreconcilable descriptions of the speech from CN’s readership. Rather than pick the competing rumors apart in some kind of quixotic quest for The Truth, we decided it was better journalism—or at least faster journalism—just to repeat them. As always, caveat lector and all that! Let me tell you about my girl troubles. Four things happen when girls are in your research institute: they have heaving breasts; excited by their heaving breasts as they breathe in and out deeply, you’re overcome by a lust you have never known before; you fall in love with the girl behind those breasts, with sincerity and unfathomable depth; and you cry when she refuses to give you that textual healing. Your spirit is destroyed, you continue to long for her, and your tears flow incessantly. Which not only puts you off your cricket game but has impacts downstream, on the lesser aspects of your life—your dharma, your religion, the quality of the science. There you are, chairing an IPCC meeting and surreptitiously sending her messages; and she still refuses your fervent offers to keep and nurture her heart. What the hell? That makes about as much sense as—say—not letting me touch you, even though I’ve always treated your body with reverence and as sacred! 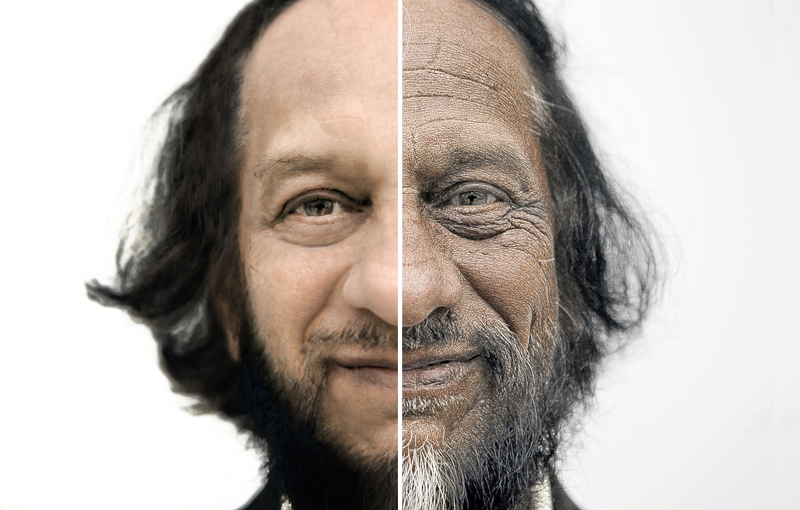 This entry was posted in Uncategorized and tagged humor, Rajendra Pachauri on September 21, 2015 by Brad Keyes. Welcome to our new Humor section,‡ which highlights some of the wittiest, drollest remarks from climate’s razor-sharpest thinkers. CN’s Asia correspondent Kay Fabe—desperate to be treated as more than a pretty face in the newsroom, apparently—has just filed the perfect story to kick the genre off. Thanks to social media, which is my way of saying Twitter, yesterday’s hilarious comments by Dr Rajendra Pachauri have gone so virulent, so fast, that some are already calling him the fresh prince of stand-up science. 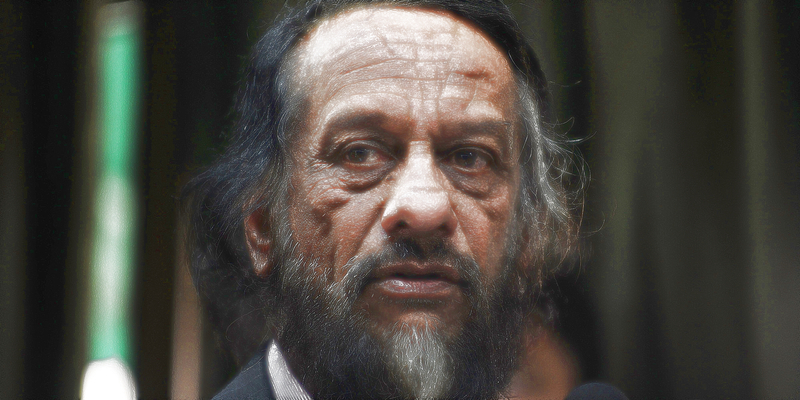 A Life in Women: Pachauri has been a leading speaker on women’s issues for years. But yesterday this serious thinker took on a decidedly unserious topic—women in science—with very funny results! 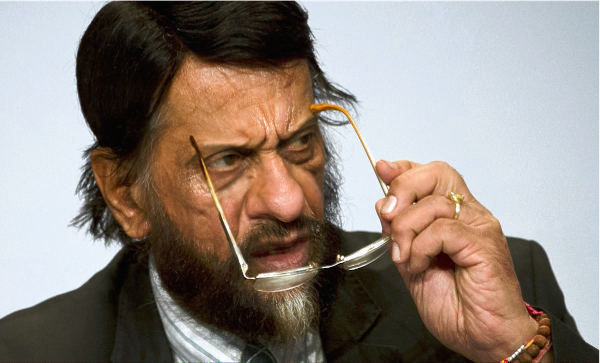 The world has long admired Pachauri, not just for “ending the debate over whether climate change matters” as Foreign Policy put it in November 2009, but for his personal qualities: cleanliness, articulateness, a religious devotion to science and a healthy distrust of skepticism. What we’ve never fully appreciated, though—even in hard-core pachyphile circles—is the climate guru’s wicked sense of humor. Now, in the wake of a virtuoso observational riff that literally had the audience a-twitter, will the Nobel laureate’s contribution to comedy finally get the attention it deserves? Dr Pachauri was the main speaker at a gala fundraiser for Women In The Laboratory—the group that represents millions of women in Asia’s science, technology, engineering and mathematics [STEM] sector—held yesterday in Delhi. 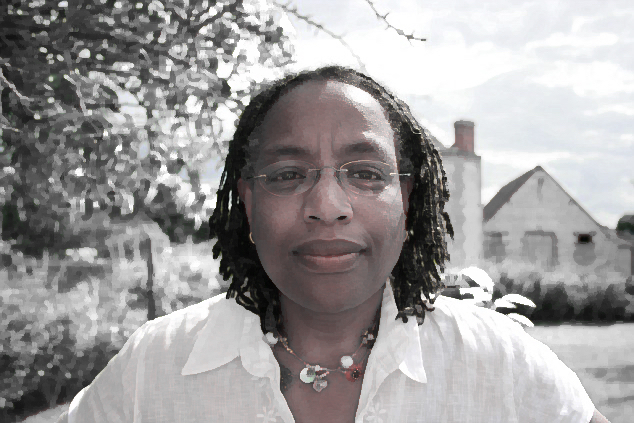 “It’s strange that a chauvinist monster like me has been asked to speak to women. “You know the problem with letting girls work in a scientific environment? They burst into tears as soon as you even suggest you can’t take your hands off their breasts,” he joked, to an audience made up mainly of Indian women and Ivan Oransky. Frank, uninhibited feedback is the lifeblood of scientific research, he explained. “Which couldn’t possibly be good for the science,” noted Pachauri, Nature‘s 2007 Newsmaker of the Year. This entry was posted in Uncategorized and tagged humor, Rajendra Pachauri on September 20, 2015 by Brad Keyes.